KZ Sportsmen Classic provides all the amenities of home in an ultra lightweight, easy to tow package. The Sportsmen Classic is versatile and offers your family comfortable, flexible floor plans in a variety of configurations, including expandables, travel trailers, and even toy haulers! Wherever you go in a KZ Sportsmen Classic, the conveniences of home will go with you. All units are family-friendly and features roomy, comfortable living space complete with amenities such as digital media stereo with Bluetooth technology, 12-volt USB ports, and a Key-Alike system so that one key fits all baggage and entry doors, plus much more! The Sportsmen Classics come in a variety of easy to tow packages made strong by the KZ Exclusive Tough-Shield exterior, front diamond plate, and Alum-a-Tough® roofing which is backed by a 12-year limited warranty. You can choose an Off-Road package that offers 15-inch mud tires and extra ground clearance so you can go where the fun is! 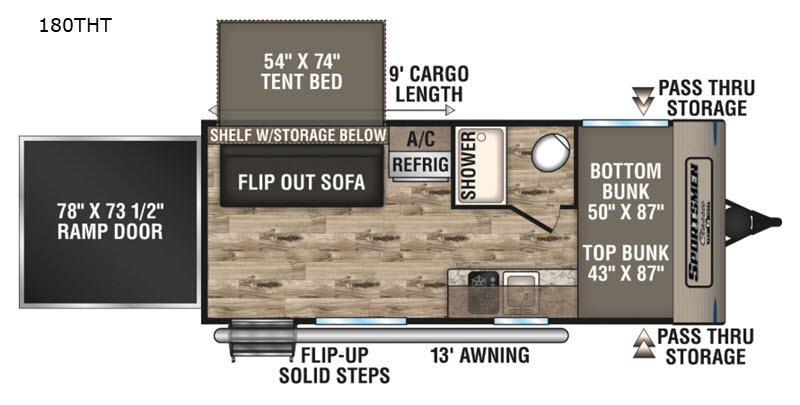 The KZ Sportsmen Classic expandables, travel trailers, and toy haulers make up eleven different floor plans. So, come choose the model that’s perfect for your family and travel needs!